The Janus Switch v.2 (2016) is a digital performance work merging live cinema and electronic sound in a poetic exploration of generative audio-visual feedback structures. Janus, the two-headed Roman god, was notable for his ability to look in two directions at once. He was known as the god of doorways and passages. The Janus Switch is a techno-poetic realization of these ideas, where signal streams are switched rapidly back and forth to create a wide range of sonic and visual interactions. 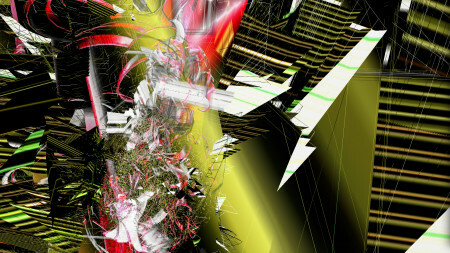 The system software, created by Cory Metcalf in collaboration with David Stout, allows for real time mixing of mathematic data to create an evolving array of hybrid audio-visual forms and aesthetic behaviors. While the technical methods can be interesting in and of themselves, the work is driven by the visceral experience produced by the fleeting imagery that emerges in the process of navigating the system. The work is paradoxically, highly composed and thoroughly improvisational. The image vocabulary, like music, reveals its source as a kind of fluid state of transitory becoming. What emerges for the viewer is a dynamic subjectivity, as the audience must actively complete the circuit to co-create the meaning or apparent “thingness” of what the mind and body is confronting. In this process of “Janus Switching” many things, places and ideas come and go, including allusions to landscape, cellular life, plant forms, mechanistic structures, gateways, glyphs and vessels, just to name a few. All of the resulting sound comes from the direct sonification of the image processes. The sonification methods allow for working in both tonal/atonal and/or timbre oriented modes including a wide array of subtractive noise-based soundscapes. David Stout is a visual artist, composer and performer exploring cross-media synthesis and interdisciplinary approaches to hybrid genres bridging the arts. He holds an inter-arts MFA from the California Institute of the Arts where he studied with Ed Emshwiller, Jim Pomeroy, and Bill Viola. His award-winning works include live cinema performance, interactive video installation, electro-acoustic music composition and immersive performance events that integrate emerging technologies and multi-screen projection as an extension of performer, audience and architecture. Since 2002 he has worked closely with creative partner, Cory Metcalf to examine the aesthetic possibilities for evolutionary generative systems, artificial life networks and simulation environments. The pair, who began their seminal collaboration in Santa Fe, New Mexico, are renowned as founding members of the critically acclaimed visual music ensemble, NoiseFold. Their performances, which have included the UNESCO Creative Cities Summit, the New York Electronic Arts Festival, Interactive Futures in Victoria, BC, “Chinati Weekend” in Marfa, Texas and REDCAT in Los Angeles, have garnered enthusiastic reviews and a growing international audience. Stout is currently founder and director of the Hybrid Arts Laboratory at the University of North Texas, where he coordinates the Initiative for Advance Research in Technology and the Arts (iARTA) and holds joint positions in Music Composition and Studio Art/New Media.